March 19, 2019 — Comments are off for this post. Kimpton Hotels and Restaurants, a boutique hotel brand of IHG, today is rolling out a new initiative that will let guests book special rooms at many of its hotels and participate in unique experiences offered in each, all designed to let them enjoy deeper human experiences. To that end, from September through November last year, in what it called the “Room 301” experiment, Kimpton set aside one room at its Everly Hotel in Los Angeles. Guests who chose to stay in the room were encouraged to engage with special amenities, such as the ability to paint directly on a wall and share a secret or confession. Guests were able to respond to questions on camera, contribute songs to a Spotify community playlist, and leave a message for the next guest in the room. Guests were also allowed to take photos with an instant camera to represent their mood, and asked which of the “seven deadly vices” they could best relate to. Among the findings: Lust was chosen as the guests’ top vice, and most secret confessions involved personal relationships. Among the most popular messages left for succeeding guests in the room was to call their parents, and 42 percent of guests used the instant camera to shoot photos of others, while only 24 percent took a selfie. Thus, Kimpton decided to invite hotels in its system worldwide—it currently manages 66 hotels and 78 restaurants, bars and lounges across the United States, Canada, Europe, the Caribbean and Greater China, with 27 properties in its development pipeline—to create their own individual “immersive and interactive hotel experiences,” which is being announced today on the brand’s “Stay Human Project” website. Two of these experiences will be available for guests to try tonight, while more than 20 more will be introduced through the end of 2019; all can be booked starting today. Rates for these special rooms will start at $229 per night. Among the new experiences will be the “Work It Room” at the Mason and Rook Hotel in Washington, D.C., which partnered with Vital Voices, a nonprofit focusing on female leadership, to share access to a library with feminist literature, a communal Spotify playlist they may add songs to; and a “power pose” photo area. Guests in the room at the Aertson Hotel in Nashville will have access to a guitar, microphone and iPad loaded with music-composition software, while guestbook pages will resemble sheet music. And the Prohibition-themed guest room at the Sir Francis Drake in San Francisco will feature 1920s-inspired food and drink, and an iPad photo booth that produces black-and-white photos, among other amenities. 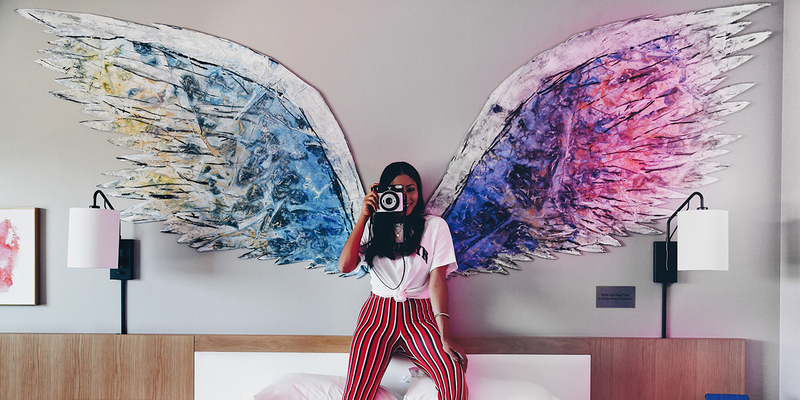 The foundation for the guest room experiences initiative was laid in February 2018, when Circus Maximus created a new campaign for Kimpton that included a digital ad about how humans were its “secret ingredient to heartfelt hospitality.” The budget for this was $40,000. This campaign was followed by a $5,000 digital campaign—created by Allison+Partners and Kimpton— launched in September 2018 for the Everly initiative. The Stay Human Project being introduced today was created by Kimpton and will be promoted by $4,000 in digital advertising on Facebook and Instagram. Kimpton’s ultimate goal with the new initiative, Reidenbach said, is to appeal to a wide range of guests—including individuals, couples and families—and to differentiate its brand from its competitors, which include huge hotel companies like Marriott and Hilton, and independent boutique brands like Ace.